This article will describe how to create ZFS storage pool and share storage via NFS/SMB. zfsutils-linux is a ZFS userland tools. zfs.ko is ZFS device driver. Create storage pool with using /dev/vdb and naming tank. Now you can use /tank as ZFS file system. Instal NFS server. No need to edit /etc/exports and run exportfs. Now share storage pool via NFS. Below command will provide writable storage to 192.168.11.0/24 network. NFS mount from 192.168.0.24 network. IP address of server running ZFS storage pool is 192.168.11.67. In the case of SMB, it needs to edit /etc/samba/smb.conf. This article will disable guest access and allow user which is added by pdbedit. /var/lib/samba/usershares is created by zfs command. Share storage pool via SMB with zfs command. User can only read to /tank because of /tank permission. If you need to write /tank, please chmod /tank. 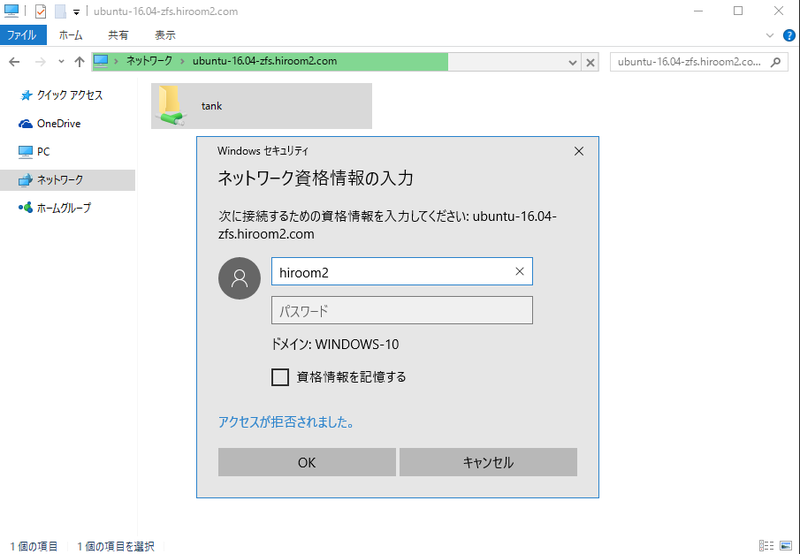 Access \\ubuntu-16.04-zfs.hiroom2.com\tank from windows machine and display username/password dialog. ubuntu-16.04-zfs.hiroom2.com is name of server running ZFS storage pool.